Traveling abroad with a baby for the first time | escaped. ...I've learned, that you can't have everything in the world. Sometimes, babies do have their own attitude in a flight, and you just have to deal with it. Rayyan might be the nicest baby (well I'm totally biased here, but still it's my first time handling a baby all by myself and we've survived) but on a plane, I wasn't so sure. Thing with babies is, their behavior is so random as there are many first-times in their lives, so their reaction to each case varies. Hence why I was so terrified to bring him to Japan back when he was 2 months old. But now, at 10 months, Rayyan can crawl, climb, spur baby talk outta his mouth and shout for God knows what reason, and demand us to play with him whenever he sees us holding our phones. I tell you! He just knows that we're reaching for our phones and as soon as we do that, he won't stop nagging until we pick him up or entertain him. So in December I decided to tag along with my husband for his business trip to Bangkok, after being left behind for countless times this year. I missed his Japan and Taiwan trip last few months, so this time when I heard he had to go to Bangkok, I told him my plan. It was a brilliant plan, and he finally agreed. Provided that we'd mostly be in the hotel room when he's away (I included a trip to the nearby mall for a few hours and he agreed to that, phew) and there'll be no major shopping involved. No problem. The currency is too high at that moment to spend my MYR there anyway. So hello Bangkok, from the three of us! Reaching the airport was a small start. The whole process prior to embarking was the bigger one. As we agreed not to bring stroller (too heavy to carry), we used a baby carrier throughout the process. We decided beforehand on who'd carry Rayyan and who'd bring which bag, so that nothing (or no one) gets left behind. Rayyan fell asleep as soon as I carried him in the baby carrier, so it was pretty smooth. After the whole walking to the gate passed the customs and security part, we were so tired we almost fell asleep at the boarding gate. At this point, I re-checked everything - his milk bottle, his milk dispenser, some toys for him to distract him to play on the plane, his extra diapers, his muslin cloth as a blanket, and his spare clothes. Rayyan was already awake at this time, all energetic and wide-eyed and I was nervous. We changed his diapers before departing just in case. Rayyan was excited and puzzled at the same time, watching so many other people around him. I wish I had an iPad to distract him lol. We kept entertaining him (as long as he didn't crawl on the floor). Then, taking off.. I could hear other people trying to keep the noise down or say their prayer. It was calm. I was mortified. We both tried distracting him to keep his "chatting" down, but he suddenly decided it was time to practice his syllables, or something. He was shouting! (in baby language of course). He didn't cry, though; he was just his jovial self. But other people seem not to be bothered, surprisingly. I was expecting some "hush" or "shush" but nothing! Either it wasn't that loud, or they've grown accustomed it, I'm not sure. But I'm kissing the ground as soon as Rayyan stopped talking and focusing on the outside. "Rayyan, look, look! Awan! WAAaahh so beautiful!" It worked. He got distracted and kept quiet, enjoying the view. After the whole "chatting", he got tired and we fed him milk. Just like that, he fell asleep - for the whole 2 hours! You have no idea how relieved we were. It wasn't so bad, despite the "chatting" haha. I'm more grateful he didn't cry as most articles say babies tend to get their ears blocked and get uncomfortable in the flight which can lead to crying and tantrums. 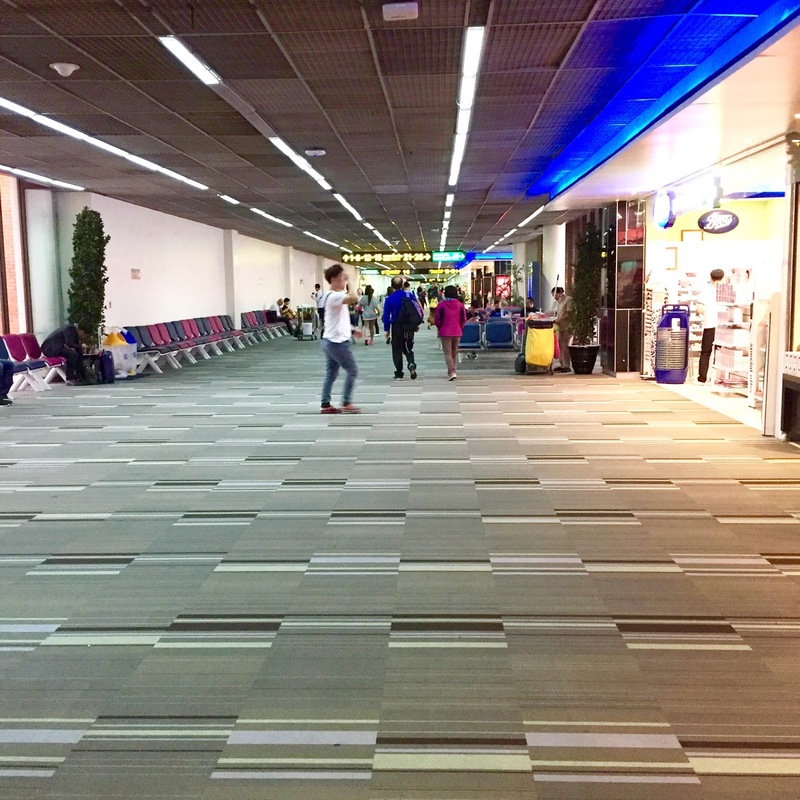 Reached Don Muang airport, and there were many more surprises await us. Will continue soon!